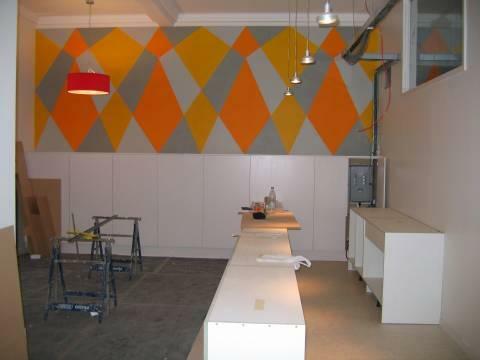 The project is to design and execute two large wall paintings in a building which will be used for educational purposes in Hackney, East London. Still no decent photos I’m afraid. The facade is still boarded up, so light is still bad. The architect’s PA has promised to inform me when it comes down, and as I’ve said before I hope there are no unpleasant surprises. I’ve finished "London Red". Will have to wait until the security screen comes down to guage the final effect. I’ve decided the first image needs another coat of Cadmium Yellow which won’t take long, then it’s time for some proper photographs. 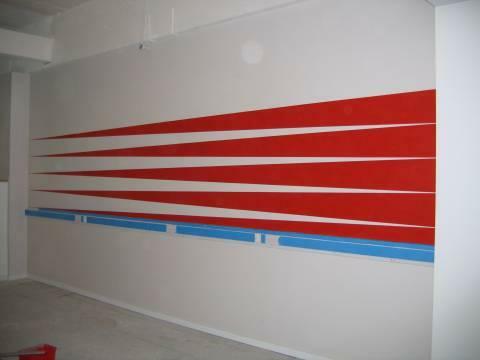 There’s a possibility the client may want a third wall painting – so I’ve drafted out some proposals. There’s talk of modifying one of them – something I’m not happy about, as I’m not an interior designer. I’m quite happy to develop these ideas further and welcome input from interested parties but need to be wary of the development being driven by them. We’ll have to see what happens. The first image is thankfully now complete. I’m really pleased with the way it works in its given space. The chippys have built a long, shallow series of cupboards underneath to hide the building’s electrics. This will be painted very light grey. 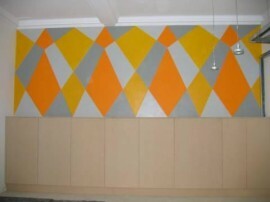 We knew that would happen from the onset and it dictated the proportions of the wall painting. So, it’s time to concentrate on image two “London Red” . This is situated in an area that for now has a lot less light coming through. This is due to the building’s facade temporarily fitted up to over head height for security reasons. When this is removed light will flood through the fully glazed front. Having settled on the red to be used I still don’t know how it’s going to work when we get proper light and I don’t like surprises that are this big. On the plus side the reflections of the red buses passing by outside should interact with the painting very well. Let’s hope so. To the contractor the artist and the art is of the lowest priority, way lower than the painter/decorator, perhaps that’s as it should be? I’m re thinking my pleasant comments about artisans from my previous blog! Hopefully my next blog will contain photographs of the completed “London Red”, but then who knows when that shuttering is coming down? I'm pleased to say the method we had devised to mark out the second image worked well. Whilst working on the image I took pleasure in the thought that “pouncing” through a cartoon is a technique that has been used over many hundreds of years. This is a recurring theme in a lot of my work with references back to artists and artisans of the 14th and 15th centuries who were no strangers to non figurative work. The second piece of work has now been completely marked out and I have started filling in the colour. I have not reproduced an image such as this to such a large scale and the results were quite startling – with a dynamism and sense of movement I really had not envisaged. I'm very excited at the prospect of finishing it. The working title is “London Red” as I've been reading Peter Ackroyd's book about London, and it seems appropriate. Whilst visiting Milan last week I went to the Castello Sforzesco. There is a room there called the Sala degli Scarlioni which was the audience hall of the Duke and takes its name from the red and white decorative zig-zag motif used on the walls, called scaglioni or scarlioni. Uncanny, eh? 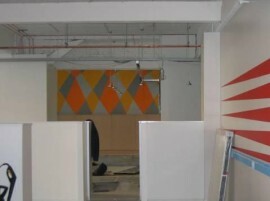 My intention this week was to start marking out the 2nd wall painting. 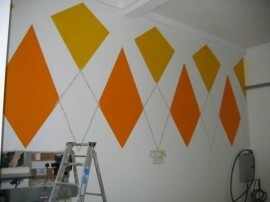 This 2nd image involves drawing straight lines over 6 metres long – to make up a series of very long, thin triangular forms. In order to do this we were going to scan a scaled drawing into a computer and then enlarge to full size as a series of sheets that can be blue tacked to the wall in proper order. 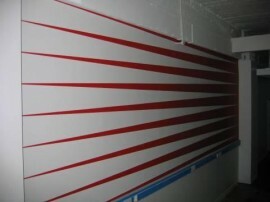 The next step being to pounce through onto the wall a series of marks then joining up the marks with a straight edge. However, due to unforeseen circumstances the cartoon was not available. Hopefully they will be next week as I am keen to start work on the second image. 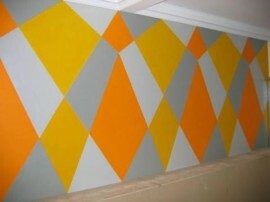 I made good progress with the first wall painting – filling in blocks of cadmium yellow. Needless to say more than one coat of paint is required. The process is time consuming but I am pleased with the results so far. Visual artist workingÂ in various media. 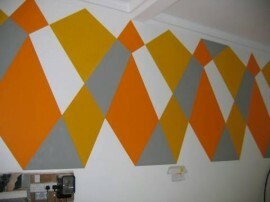 Non figurative work based on geometry, with a strong use of block colour.